Phebe Warner Quilt This item is on sale. 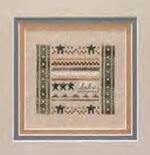 FROM STORE OVERSTOCK, NEVER USED...From Rosewood Manor, stitched on 28 count Cream Cashel linen using DMC floss. Stitch count is 200 x 200. Phrase Mini Block - Live The Life You Love This item is on sale. FROM STORE OVERSTOCK, NEVER USED, chart is in EXCELLENT condition. From Hinzeit, the "love" and "life" in this design are interchangable so you may make this design your own. Comes with the silver tone charms that are used and also with two colorways, one for pastel and one for neutrals. Shown in 28ct Lambswool using DMC floss with a stitch count of 43 x 211. FROM STORE OVERSTOCK, NEVER USED...From Hinzeit, the "love" and "life" in this design are interchangable so you may make this design your own. Comes with the silver tone charms that are used and also with two colorways, one for pastel and one for neutrals. Shown in 28ct Lambswool using DMC floss with a stitch count of 43 x 211. Piccadilly Lane This item is on sale. FROM STORE OVERSTOCK, NEVER USED, in EXCELLENT condition...From X's & Oh's, stitched on 28 count Antique White Jobelan using DMC floss. Stitch count is 280 x 110. Pickled Pumpkin This item is on sale. From Hillside Samplings, published 2002. Chart is in EXCELLENT condition, appears never used, with no markings of any kind and price stickers on front cover. Picnic Basket This item is on sale. FROM STORE OVERSTOCK, NEVER USED...From Imaginating and Diane Arthurs, chart is in EXCELLENT condition, appears never used, with no markings of any kind and price stickers on front cover. Pin Feathers This item is on sale. FROM STORE OVERSTOCK, NEVER USED...From Hot House Petunia Designs, this punch needle pattern comes with the preprinted weavers cloth. Works up to approx. 2 3/4" square using Weeks Dye Works and Gentle Art Sampler Threads (or DMC) and Mill Hill beads 16004 & 18002. Pina Ghoulada This item is on sale. FROM STORE OVERSTOCK, NEVER USED...From Hot House Petunia, punched on pre-printed Weaver's cloth (included) using Weeks Dye Works, Gentle Art Sampler Threads, amd Crescen Colours. Finished design size is 4.25" x 3". Pincushion Wristlet This item is on sale. FROM STORE OVERSTOCK, NEVER USED... From Olde Colonial Designs, this COMPLETE KIT includes chart, linen, floss, needle, wristband, Velcro, button, and finishing instructions. Pineapple Collection This item is on sale. FROM STORE OVERSTOCK, NEVER USED, chart is in EXCELLENT condition. From Sudberry, this leaflet contains a collection of designs all featuring the welcoming Pineapple! Designed for trays, box tops, coasters or just to be framed, they are shown stitched on different counts of White Aida using DMC floss. Pinecones In Winter Fob This item is on sale. FROM STORE OVERSTOCK, NEVER USED...From The Sweetheart Tree, worked in woodsy tones of Hunter Green and Brown. This is the perfect companion to match our new "Pinecones In Winter Biscornu" - both pieces are fun to stitch this Winter while you huddle inside to stay warm. The Crystal-Clear Paillettes used cast a lovely Silver sparkle and add a special sophisticated touch. Because of its diminutive size it's quick to stitch and can be worked on 28 or 32 count Summer Khaki Linen. Pingirl, The This item is on sale. FROM STORE OVERSTOCK, NEVER USED...From The Primitive Jewel, this is a quick stitch and is stitched on 28ct cream and a 3 x 5 piece is needed. The Sudberry House pincushion is #15761. Pink Begonia This item is on sale. FROM STORE OVERSTOCK, NEVER USED...From The Lilac Studio, out of print chart is in EXCELLENT condition, with no markings of any kind and price stickers on front cover. Piper Super Cub This item is on sale. From A&L Designs, out of print chart is in EXCELLENT condition, appears never used, with no markings of any kind. Piping Hot Samplers This item is on sale. FROM STORE OVERSTOCK, NEVER USED, IN EXCELLENT CONDITION...From Carriage House Samplings, "baking day" and "tea time" are shown stitched on 35ct Onyx and Garnet linens using Needlepoint Silks. Stitch count of either is 48 x 47. Pirate's Life, A This item is on sale. FROM STORE OVERSTOCK, NEVER USED...From Country Cottage Needleworks - yo ho, yo ho, A pirate's life for me! Styled to look like a whimsical old treasure map, this design was stitched on 28xt Vintage Light Examplar Linen and the frame is from Crescent Colours' line The Family Tree. Uses DMC Floss, Crescent Colours and Weeks Dye Works. Pitiful Pals This item is on sale. From Dale Burdett, out of print chart is in EXCELLENT condition, appears never used, with no markings of any kind and price sticker on front cover. From Dale Burdett, published 1985. Out of print chart is in EXCELLENT condition, appears never used, with minimal writing on inside front cover. Includes 13 designs. Play Time - Our House Pearls This item is on sale. FROM STORE OVERSTOCK, NEVER USED...From Samsarah and the latest in her series of Pearls ... Our House! Stitched on 18ct Linen Aida using Crescent Colours and embellished with a little ladybug button. Playtime Pets This item is on sale. Plenty Of Pins This item is on sale. FROM STORE OVERSTOCK, NEVER USED...Chart is in EXCELLENT condition, never used, with no markings of any kind and price stickers on protective plastic cover. Plumpers - Forever Stitching Friends This item is on sale. FROM STORE OVERSTOCK, NEVER USED...From Trail Creek Farm, stitched on 28 count linen using Weeks Dye Works. Stitch count is 113 x 76. Plumpkin This item is on sale. STORE OVERSTOCK .. From Lizzie Kate, stitched on 30ct Midsummer's Night linen (or fabric of your choice) with Gentle Art Sampler threads (or DMC floss). Stitch Count: 68W x 64H. Pocket Sampler: Dad This item is on sale. FROM STORE OVERSTOCK, NEVER USED, WITH NO MARKINGS OF ANY KIND...From Heart In Hand, this teeny yet elegant band sampler just for dad uses a sterling silver tin cut embellishment, the Dad Charm. Shown stitched on 32ct Natural Belfast linen using Weeks Dye Works and Gentle Art Sampler Threads (DMC conversions supplied). Pocket Sampler: Daughter This item is on sale.